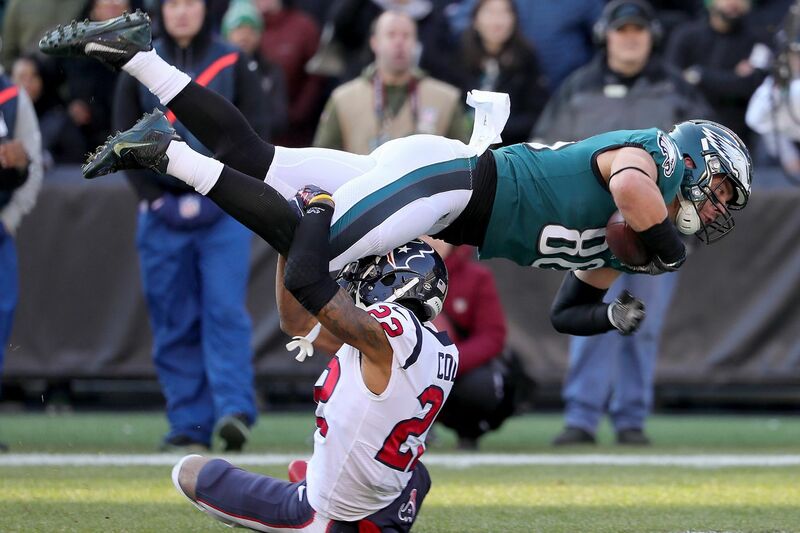 Zach Ertz flies over Texans cornerback Aaron Colvin during the second quarter of Ertz's record-setting day. As a second-round rookie out of Stanford five years ago, Zach Ertz wasn’t the least bit hesitant to tell you his career goals. He wanted to be one of the best tight ends in the league, he said. He wanted to be mentioned in the same breath as his football role model, Cowboys great Jason Witten, he said. It was a pretty ambitious plan, but one Ertz never doubted he could accomplish if he worked hard enough. “I don’t think I’ve truly come to grips with it yet," he said Sunday after breaking Witten’s single-season record for receptions by a tight end in the Eagles’ 32-30 win over the Houston Texans. Ertz was instrumental in the victory, which kept the Eagles’ playoff hopes alive, catching 12 passes from quarterback Nick Foles for 110 yards and two touchdowns. Six of his catches came on third down, including his second touchdown of the game with 10:21 left in the fourth quarter, a 23-yarder on a third-and-3 that gave the Eagles a seemingly insurmountable 13-point lead. A little later, after that seemingly insurmountable lead vanished, he had a huge 20-yard catch on a third-and-10 play with 1:29 left in the game that helped set up Jake Elliott’s game-winning 35-yard field goal. Ertz heads into next week’s final regular-season game against the Washington Redskins with 113 receptions, three more than the 110 Witten caught in 2012 when he set the record the year before Ertz entered the league. “I’m thankful for everyone that has helped me along the way," Ertz said after the game. “The one thing I know is that I didn’t get here by myself. “Jason Witten has been a huge part of this. [Former Eagles tight end] Brent Celek has also been huge for me. It truly takes a village to become a professional athlete. I’m so thankful to everyone who has helped me along the way. Having the record, hopefully it will last a while. But if not, I’ll be happy for the next guy. But it is special." Zach Ertz grabs a catch in front of awed teammates late in the fourth quarter to help set up Jake Elliott's game-winning field goal. Ertz had just three catches for 22 yards in last week’s win over the Rams and had just five catches for 38 yards the week before in the Eagles’ overtime loss to the Cowboys. But on Sunday, Foles, who threw for a franchise-record 471 yards and four TDs, looked for his Pro Bowl tight end early and often. His first pass of the game was to Ertz – an incompletion thrown slightly behind him. But he connected with Ertz on four other passes on the Eagles’ first possession, a 13-play, 77-yard touchdown drive. By halftime, Ertz already had nine catches for 56 yards and a touchdown. “[The Texans] are a big zone team, a big zone defense," Ertz said. “And finding [openings] in zones is something that I take a lot of pride in. “We weren’t able to run the ball as efficiently as we wanted to [just 57 yards on 22 carries]. So we kind of had to pass the ball more. I’m just glad we won the game. To have that many targets  and catches and to win the game feels really, really good." Some have suggested that Ertz has been too big a part of the Eagles’ offense this season; that Foles and Carson Wentz have thrown to him too much at the expense of other receivers like Alshon Jeffery. But that’s nonsense. Jeffery had 82 receiving yards against the Texans, and Nelson Agholor also had his best game of the season, catching five passes for 116 yards, including an 83-yard touchdown. Zach Ertz (left) celebrates teammate Nelson Agholor's third-quarter touchdown reception. Foles completed 12 of 13 passes for 149 yards and a touchdown on third down against the Texans. Ertz caught six of those 12 passes, five of them for first downs. He now has 22 third-down receptions, which is among the league leaders. He has a team-high eight touchdown passes, including seven in the red zone. “Quarterbacks do have a comfort level with Zach," coach Doug Pederson said. “He seems to kind of be that guy that you know exactly where he’s going to be, and he’s obviously great after the catch. He runs great routes. “So, for the quarterbacks to have that type of guy, it just gives you that little comfort, especially in crucial moments like the corner route that he ran late in the game. It’s a credit to him for how hard he works, and then his relationship with our quarterbacks." After the Texans took the lead with 2:04 left in the game, the Eagles got the ball back on their 11-yard line. Foles completed a 19-yard pass to Jeffery on a third-and-10, but was flattened in the end zone by Texans’ edge-rusher Jadeveon Clowney, which drew a roughing penalty. Foles left the game for a play, but quickly returned. After missing Agholor on a deep ball on second-and-10, he connected with a wide-open Ertz for the 12th time in the game on a 20-yard completion that gave the Eagles a first down at the Houston 35. A 16-yard run by Darren Sproles moved the Eagles to the 19. Three plays later, Jake Elliott booted a 35-yard field goal with no time left to win the game. “It was kind of a scissors route that we use a lot," explained Ertz of his key 20-yard reception. “I had a corner on me, and Darren [Sproles] was in the flat. I had been taking a lot of inside releases against him, so I kind of sold the inside release and threw him inside, and I think he kind of ran into the linebacker. “My feet got tangled up somehow, so I was kind of off-balance. But Nick just kind of laid the ball out there and allowed me to run under it."